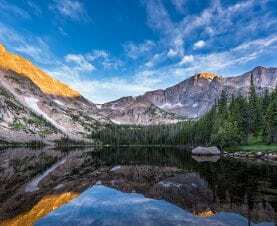 A definitive guide to camping when visiting Colorado’s most popular National Park – Rocky Mountain National Park. First, I’ll talk about how to find and reserve the best campsites in the Park. Then, I’ll give you camping alternatives during the busy summer season. Finally, we’ll talk about “wilder” camping: backcountry, winter, and the ultimate adventure – cliff camping. In summer, afternoon thundershowers and lightning are common and move in quickly. The higher in elevation you go, the colder it gets. 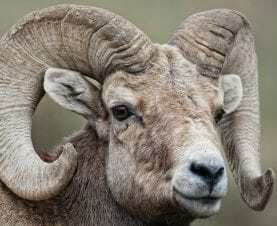 Rocky Mountain National Park Campgrounds are above 8,000 ft in elevation, and hiking trails go much higher. There can be a wide variation between daytime and nighttime temperatures. Use the food storage lockers provided in campgrounds, or bring portable bear canisters. Don’t leave food in your car. Dress in layers so you can add warmth or cool down as needed. A lightweight down sweater is great for chilly evenings. Don’t forget a waterproof outer layer! Pack the right gear, and do a test run setting up your tent before you leave home to make sure everything you need is packed and working. A missing tentpole makes for an uncomfortable night in a windy rainstorm. Choose a tent spot with good drainage, not a low spot where water might pool. Bring a hot water bottle to bed with you to warm up your sleeping bag. Put the clothes you’ll wear in the morning inside your sleeping bag so they will be warm when you put them on. Lay your sleeping bag on top of an insulating pad so the ground doesn’t steal your heat. Bring your hiking boots inside the tent at night so they don’t get wet with dew or frost. Several stores in Estes Park carry mountain clothing essentials and gear for hiking and camping. Link to shopping page. For “everything camping equipment” that you’ll need, and last minute things you’ve forgotten – visit REI online or stop at their store in Fort Collins or Boulder on the way up to Estes Park. With over 4 million annual visitors, Park campsites fill up in the summer, especially in July and August, so it’s a good idea to make a reservation early. You should definitely reserve if you’re planning for specific dates during the summer. Park campgrounds are open seasonally and reserveable from late May to late September or early October. Tip: Mark your calendar so you’ll remember when you need to reserve. 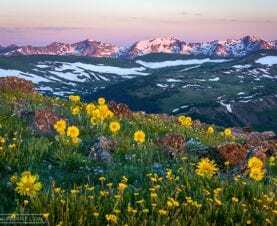 The best campgrounds for camping with an RV inside Rocky Mountain National Park are Glacier Basin with 73 RV only sites that can take up to 35 ft long RVs and trailers, and Moraine Park with 101 RV only sites that accommodate up to 40 ft. RVs and trailers. Tip: Favorite RV campsites with a spectacular view of Longs Peak across Moraine Park are on the meadow side of Loop C in the Moraine Park campground. Grab one if you can! There are NO HOOKUPs at any of the national park campgrounds, but dump stations are available at both Moraine Park and Glacier Basin. Generators are limited to running between 7:30 – 10 am and 4 – 8:30 pm inside the Park. National Park Shuttle Buses stop regularly at both Moraine Park and Glacier Basin and deliver you to favorite trailheads on the east side of the Park. See map here. If you’re looking for less boondocking and more comfort, private rv parks and campgrounds located around Estes Park have more facilities for RV visitors with electric, water, and sewer hookups, and full restrooms. In summer, free Estes Park shuttle buses take you around town and connect with National Park shuttle buses to take you into the Park. If you don’t tow your own vehicle to get around in, check that the RV park you choose is on one of the Estes Park bus routes. Ok, so you didn’t or couldn’t plan your summer trip ahead of time, and now you’re in Estes Park – how can you find a campsite at the last minute? Park Campground check-out time is noon, and check-in is 1 pm. Sometimes sites will become available at the last minute if you wait in line for them. Check with the campground office to see if your chances look good that day. Head for one of the Estes Park area campgrounds outside the Park (listed below) – they are often less crowded. Finally, you can camp further away from the Park at one of the national forest campgrounds in the area. www.reserveamerica.com lists them all. Note: though they may look close on a map, it can be a long drive up and down mountain canyons to get into the National Park. If no campsite spaces are available in Rocky Mountain National Park, there are some other good options available just down the road, still near the Park and close to Estes Park. Manor RV Park – 110 full hookup sites, pet-friendly, laundry, playground, on Big Thompson River. Weekly, monthly, and summer spaces. Call (800) 797-7857 to reserve. Yogi Bear Jellystone Park™ of Estes has over 110 campsites available with several options – No Hook Up Tent Sites, Water & Electric Sites, Premium Water & Electric Sites, and Full Hookup Sites. Family & Kid-Friendly activities. For more information or to reserve, call (970) 658-2536 or check out their website. There are two campsites managed by the Estes Valley Recreation and Park District: The Estes Park Campground at Mary’s Lake and The Estes Park Campground at East Portal. These are open from mid-May 15th to the beginning of October. Reservations can be made online at www.ReserveAmerica.com or through the call center at (800) 964-7806. For more information and the guidelines for reserving you can go to the EVRPD website. Hermit Park Open Space campgrounds are located 2 miles from Estes Park and open year-round. Reservations can be made 180 days in the future. Hermit Park has 108 campsites in 5 different campgrounds: Hermit’s Hollow, Bobcat, Kruger Equestrian with horse facilities, Granite Gulch, and Camper Cabins. Each of these can be reserved through the reservations call center at (800) 397-7795 or online at the Larimer County Camping website. Three other private RV parks are located near the Beaver Meadows entrance: Elk Meadows, Spruce Lake, and Paradise on the River. Rocky Mountain National Park has a year-round, wheelchair-accessible backcountry campsite near scenic Sprague Lake. The camp is located one-half mile from the parking area via a fully-accessible hardpacked gravel trail. Campers leave their vehicles behind at the trailhead and pack their gear and water into the campsite using motorized or non-motorized wheelchairs. The camp accommodates up to 12 campers including a maximum of five wheelchairs. Accessible picnic tables, fire grate, charcoal grill, and accessible privy are there, but no electrical hookups or water faucets. Service animals that have been trained to perform specific tasks for the disabled visitor are allowed, but emotional support (“therapy animals”) and service dogs in training are considered pets and are not allowed. Reserve the Sprague Lake handicamp site by contacting the Backcountry Office. Rocky Mountain National Park has over 350 miles of trails and over 400 square miles of backcountry to explore. Rather than cover all the information here, see our Adventures page on backcountry camping and backpacking. Get a permit from the Wilderness Offices 970-586-1242. Open 7 days a week. On the East (Estes Park) side of Rocky Mountain National Park, there are 32 drainages to explore, with designated backcountry campsites. In the winter, if the designated site has more than 4 inches of snow, you should camp at least 200 ft away from the site – do not camp in the site! For the ultimate camping adventure, spend a night camping out on a sheer rock face hundreds of feet off the ground. Are you the adventurous type with Cliff Camping on your “Bucket” list? Cliff Camping on a portaledge isn’t just for ‘big-wall’ climbers with years of experience. 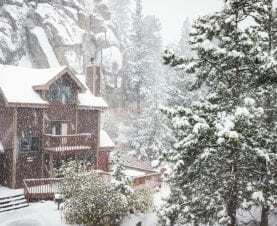 The Kent Mountain Adventure Center, a rock climbing and outdoor adventure school in Estes Park promises to help anyone experience an authentic big-wall adventure. Rappel down, or climb up! KMAC wants to create the most memorable night of your life, with a night a big-wall climber could only dream of: steak dinner, wine, omelettes and lattes for breakfast, all from your room-in-the-sky! Sounds like fun! Kent Mountain Adventure Center.